When the Upstate New York winter forces everyone to stay indoors, Rochester’s venues answer with the most genius, creative ways to have fun. One entertaining evening for the 21-and-over crowd is the Rochester Museum and Science Center’s After Dark series. In addition to full after-hours museum access, admission includes cash bars, science demonstrations, and tons of child-like activities engineered for maximum fun. Costumes are always encouraged, and past themes have included Speakeasy, Totally 80s, Monster Bash, Geek Chic Prom, and several others. If you’ve never been, beat the winter blues by snagging some tickets to the event coming up on February 8th. 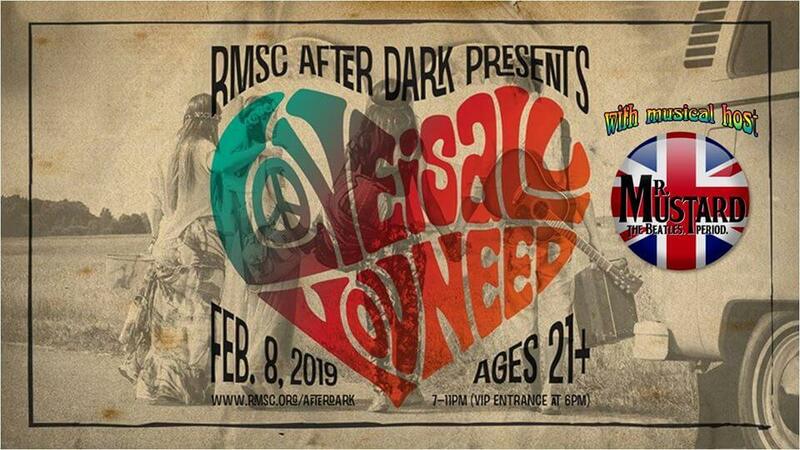 The theme of this winter’s RMSC After Dark Event is “Love is All You Need.” Come in from the cold to a warm, 1960s-style hug courtesy of the museum and a hundred or so kindred spirits. Beatles tribute band Mr. Mustard will transport everyone back to the time of the British Invasion for a night of Manhattans and nostalgic sounds. To take your indoor fun to another level, you’re invited to craft your own instrument and flower crown. Those who like to be the center of attention can even get a complimentary beehive hairdo! There will be two showings of a Beatles laser show in the planetarium at 7:30 and 8:30, after which you can take a fantastic musical voyage in the SoundSense Exhibit. Must be 21+ to attend. Valid ID required for entry.